The last seven years have been tough for Greece on several levels. In this article, written by a Greek, we conduct a short PEST analysis. This stands for a Political, Economic, Social and Technological framework. Focusing on the first three, we reflect on what has happened in recent history and what the situation is today. The last 10 years and especially last 7, the Greek Economy has entered into a period of deep crisis. More than 26% of the Crude Domestic Product of the country has been lost during the period 2008-2013. With the exception of 2014, the year at which was also observed growth of 0,8%, the economy of the country continued on a recessional route at the 3rd quarter of 2015 consequently growing the bending at 3,8%. At the year 2016, the forecasts show zero growth, while provided that the evaluation and the agreed reforms are completed, a positive change of GNP is considered likely and furthermore, during 2017, in a growth percentage of 2%. The inflation is expected to oscillate in positive rates of 0,5% in 2016 compared to the previous year and the unemployment is projected to recede at 0,3%. As a natural consequence, these conditions have been rendered particularly painful for the entrepreneurial sector of the country. In the seven-year period 2008-2014, more than 229.000 enterprises announced cease of operation, while this collapse is continued this year as well. Beginning January 2016, 15.435 enterprises have suspended their operation, a number increased by 45,87% with regard to the equivalent of year 2015, and 30.000 workplaces have been lost. At the same time, at least 21.000 enterprises balance in the limit of survival while even four colossal domestic enterprises declared bankruptcy (“Papasotirioy Ltd”, “Pyrsos Security”, “Electronics of Athens”, “Athens Ledra Hotel”). In conclusion, 2016 is forecasted to be particularly worrying for the Private Sector. Recently negotiated with the creditors and agreed by the Government austerity measures include excruciating taxation for the enterprises, with increase of Tax of Added Value (ΦΠΑ), advances of corporate taxation, factors of Single Tax of Property of Real estates (EN.F.I.A.) as well as taxation of income, especially that of freelancers (more than 55%). The political scenery of Greece during the decade, and specifically at the last 7, is intensely unstable. From 2009 the country has carried out five Parliamentary Electoral Processes (2009, 2012(x2), 2015(x2)) resulting in changes of 7 Prime Ministers and 7 Governments of which only three were not of a temporary manner, a Nationwide Referendum (2015) and two Local Governance Electoral Processes (2010, 2014). This phenomenon, in combination with the revelation of phenomena of corruptness of many MP and the application of unpopular to the electoral body measures for the financial crisis, has led to intensity of polarization and division, a rise of mistrust to the Political Body and effervescent locomotion of voters to politically utmost. Furthermore, the continuous electoral processes and the alternations of the strategy implemented by each Government led to a growing gap with the partner-countries as a lack of confidence was introduced. At the same time, the application of necessary austerity measures and reformations that was forecasted by the Memoranda of Collaboration was not materialized by no Government in satisfactory degree, while in a lot of intervals existed obstructionisms with the not payment of dose of loan his in June 2015 as an ultimate climax, during which the country almost underwent a credit event. As a consequence, a sense of unreliability regarding Greece has been cultivated henceforth, which the running Government via continuous negotiations tries to reverse, seeking the closure of evaluation from the creditors, so that the reliability of the country abroad shall be reinstated. Deducted from the total of the Economically Active Population, during 2015 3.727.633 individuals were Occupied and 859.003 individuals were Unemployed (rate of unemployment 18%). The average number, consequently, occupied per household is hardly 0,9. During 2016 rate of unemployment is projected close to 25% (24,4% with 1.169.119 unemployed individuals to 3.613.843 occupied his January 2016 according to the Greek National Statistics Service) of the Economically Active Population, marking in deed improvement of about 2% compared to 2014, when the highest rate of unemployment during the last 42 years (27,2%). With regard to the level of education, the bigger percentage occupied (30,8%) are graduates of Secondary Education, while the percentage of graduates Third-degree education is nearby.  13,6% are remaining cases, such as the military, children in pre-school age etc. We observe that the percentage of Economically Inactive comparatively with that of Economically Active Population is much bigger. This, in combination with the particularly high unemployment, means that the growth of the country is slow-moving and the economy aged because hardly the 33,4% out of the total Population is productive. With regard to the social environment of the country, it strangles due to the deep monetary crisis that has struck the country in the past few years. The social pathogenicities show a tendency to increase, while the humanitarian question is severe. The acute phenomena of extreme poverty have led roughly 2,5 million citizens under the limit of poverty, while still, 3,8 million individuals find themselves in serious danger of deprivation due to material deprival and unemployment. Simultaneously, the last couple of years has raised yet another social question of utmost importance and obvious difficulty to confront it: the immigration wave caused by the wars in the M. East and in Syria. The country, not having the infrastructure, the economic resistance but also an obvious strategy of confrontation or even benefit of essential help from her partners, has accepted 135.000 permanent immigrants from 01/01/2016 and it is calculated that another 54.000 are trapped still inside the Greek Borders awaiting permit to move on in the EU. The numbers for 2015 a multiple of that of 2016. This datum is particularly critical as it is able to worsen the already wounded Greek Society, turning civilians even to extreme tendencies (nationalism, racism etc.). Finally, an elation of tendency for escape from the country of new students or graduates has been observed. Because of the often unbearable challenges of finding satisfactory work, both regarding the type of employment as well satisfactory salary, the abroad escape is preferred by an important portion of the population and especially to the countries of the Schengen Area in Europe where the relocation is very simple. 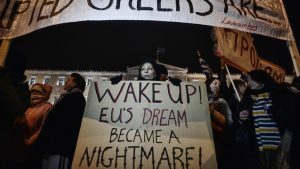 More than 200.000 Greeks, most under 35 years old, are calculated to have migrated from the beginning of a financial crisis, seeking and usually achieving more favorable conditions of professional re-establishment and career. Previous Post: Since when are rising oil prices a positive for the markets?